You can almost figure that the carpet in an apartment unit will probably have to be replaced long before the Style Police make a call. Picture walking into a recently vacated unit and seeing a year’s worth of coffee spills or discolored areas that just won’t come clean and you’ll get the idea. The deposit from that outgoing resident may help cover some of the replacement costs, but additional time to turn a unit becomes a headache. There ought to be a better way that bad carpet won’t, forgive me, pile it on a property manager. In a post-luncheon chat at an apartment industry gathering in Dallas recently, a flooring representative said one way to help reduce the expense that goes along with carpet replacement or repair is to create a symbiotic culture with the resident and carpet. Tim Skufca, national sales director of multifamily for Sherwin-Williams, agrees that kindness to this apartment interior staple can go a long way. Skufca, who for the past five years has worked closely with the multifamily industry, agrees that apartment professionals can create a culture to help prolong the life of carpet, starting with initial design or floor remodeling and working with residents. Preservation starts before anyone steps foot on the carpet. A hard-surface area between exterior doors and the carpet will help prevent the spread of dirt and debris into fibers. Create a 5’ x 5’ “landing” using tile or vinyl floor covering with a mat so people can wipe off their feet or leave shoes before walking on the carpet. Also, encourage residents to place floor mats outside of entry points. 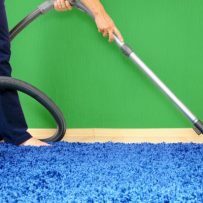 Professionally clean the carpet in units once or twice per year to minimize long-term matting, crushing and staining. Dirt sifts into the yarn and gets embedded deeper when people walk across the carpet. The yarn will start to discolor, break down and look worn. At some point, the carpet will not be able to be revitalized and will need replacing. Regular vacuuming helps keep dirt from sifting deep into the carpet and creating additional wear. Because some residents may not own a vacuum, it may not be a bad idea to give them one. An inexpensive vacuum cleaner could be the perfect housewarming gift for a new resident (or one who renews) and help increase the life of the carpet if used properly. Good vacuum cleaners can be purchased for as little as $50. Minimizing the amount of carpet in the unit or placing it in low-damage-risk areas will help get longer life out of the product, Skufca says. For example, use hard-surface flooring in areas like the dining rooms and the kitchen where carpets are more likely to get stained. “If you can put hard-surface in dining room – that’s where people eat – you’re going to prolong the life of the product while making the area look more livable,” Skufca said. Skufca added that apartment owners and managers should work with their flooring representatives to find the right solution to help carpet last longer.